Home > Computer Games > How Much Time Should Kids Spend on Computer Games? You can’t avoid children’s computer games and video games in this day and age, but as a parent you’ll probably want to keep a close eye on what your children are up to – and for how long – on the computer or games consoles. There are so many electronic computer games and toys to choose from, and kids are very clever when it comes to pulling the wool over their parents’ eyes about what they are playing on the PC. How Long Should I Allow My Child To Play Children’s Computer Games? Toddlers/pre-school children – young children of this age shouldn’t spend too long on any activity, as they are at an age where they need to experience as many different types of activities as possible in order to grow and develop. Sit with them as they play and limit time to a maximum of 30 minutes. Young school children – You can probably leave school age children alone on video games and toys, but only if you know what they are doing! At this age, they need to start to navigate their way around a PC, and they have probably been using computers at school already. At home, you might want to limit their use to 30-45 minutes of play – and extra ‘homework time’ too. Pre teens and older school children – Limit older kids to an hour a day on weekdays, with extra school work time. But make sure they really are using the PC for school work! At this age they are probably getting into social networking sites and communicating with friends over instant messaging and e-mail. Make sure they know you are around and that you are keeping an eye on their activities – and consider installing parental controls on any PC used by children. Children adore children’s computer games, they are notoriously addictive and ‘just one more game’ to beat that elusive high score can turn into another hour if you’re not careful. Use parental control software and software that can track the amount of time a child is using the PC. That way there can be no ‘but I’ve only been on here five minutes’ arguments. Some software will set a timer and shut the computer off automatically - but this is a last resort for obstructive older kids who won’t give up their computer time. It doesn’t always give the user a chance to save what they are working on so expect tantrums if they are doing homework! Set a timer for children’s computer games consoles and video games. Make sure that it has a nice loud alarm that everyone will be able to hear. These are also helpful if you have more than one child fighting over a games console. Keep all computers, games consoles and video games out of the children’s bedrooms. That way you get to keep an eye on the time they spend, and in the case of PCs and the Internet, what they are doing, too. Help children plan their video games and computer use with a wall chart. Set strict time limits. Talk to older children and decide together how much time they can spend watching playing children’s computer games. Lead by example - don't spend hours playing on a games console or online and then tell your child that they have to limit their time to 20 minutes! Make sure children’s computer games are age appropriate. 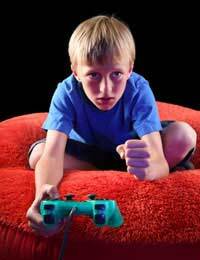 Children will always try to sneak games past you but be vigilant and always keep an eye on what they are playing. Children’s computer games can stimulate their minds and there are plenty of video games and toys which can be used to enhance a child’s learning and skills. The best advice is to watch what they are doing like a hawk and make sure they don’t spend too long aimlessly shooting things or surfing the Internet!